Poker Tournaments are one of the most profitable ways to Fundraise! Casino Themed Fundraising is fastly becoming one of the most requested Casino events! Prestige Casino Party has performed Hundreds Poker Tournaments all over Norther California . Our success rate with many organizations we now call clients book with Prestige Casino annually due to us helping them make thousands of dollars each year. 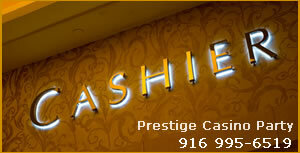 Prestige Casino is rated the #1 choice for Fundraising in and around Sacramento and The Northern California Region! Once we are booked we will guide you every step of the way,explaining state laws, helping you apply for the proper license, meeting with your team to discuss your fundraiser, planning layout and structuring your timeline. It is crucial you hire a Company with experience! We realize you are trying to make the most money possibly,so we price our services to ensure you make a profit! When planning this type of event it is essential you hire a Company that employees Professional Dealers and qualified Tournament Directors! Not all Companies are created equal, the fine line between hosting a successful Fundraiser and making lots of Money or just providing Poker tables run Tournament style is not a mistake you can afford to make!